With this technique, you have complete control over the pattern and paint colors but can easily peel the panels of the wall when you move, so you don’t have to worry about your deposit or angering your landlord. This project is all about this totally awesome, pseudo magical, no-longer-a-secret supply: TemPaint Peel-and-Stick Paint! It works a lot like contact paper and is available in a variety of colors. Because it’s made for walls, it has the ideal texture and look. It's a wall in a roll! Awesome stuff. First, wipe down walls with a damp towel to clean. Measure the height of the wall and cut length of paper, adding 1-2 inches extra and taking base boards and molding into account. For example, my wall is about 7 1/2 feet tall, so I measured 7 feet, 8 inches of paper because I cut off the extra paper where it reaches the base board. Peel off the backing of the paper and, starting at the top corner, press in place and smooth with the smoothing tool all the way down the wall. Use the X-Acto knife to cut where the paper meets your baseboard or flooring. Repeat with as many panels as needed to cover your space. Once all of the paper is applied, you can paint it. In this case, use a ruler to measure even 4-inch lines across the wall and mark with a pencil. Mark perpendicular lines on each to create Xs. Paint over the Xes to create a hand drawn-looking pattern and let dry. If you don't trust your freehanding skills, you can also paint a pattern using stencils or tape if you’d like. As long as it stays on the paper, you’re safe. Have fun with whatever patterns you want! Let the paint dry and add additional coats as needed. To remove the wallpaper, simply pull at a corner and peel back. If it’s difficult to remove, try using a blow dryer on low heat to lighten the adhesive. Then I would recommend wiping your walls down once again. A few notes about removing: there is no guarantee that using contact paper on your walls will not cause damage them when removed, so use with caution. You may want to test it on a secret area, like a closet, first. Also, once applied, you might not be able to remove and reapply it elsewhere as it may tear upon removal from the wall, specifically if you have smoother walls. These aren't dealbreakers, it's just important to understand the product. 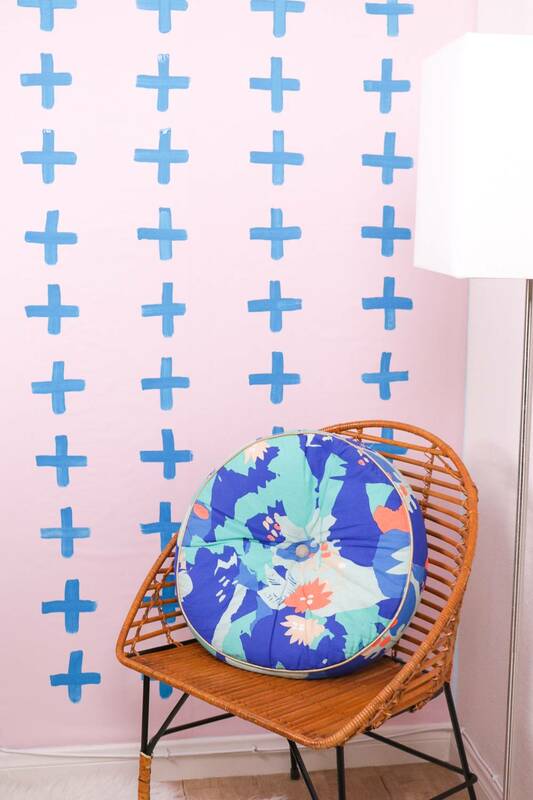 Have fun with creating an accent wall, knowing that it’s not permanent!